Hubby has had this super craving for Jackfruit patholis for a long time now. 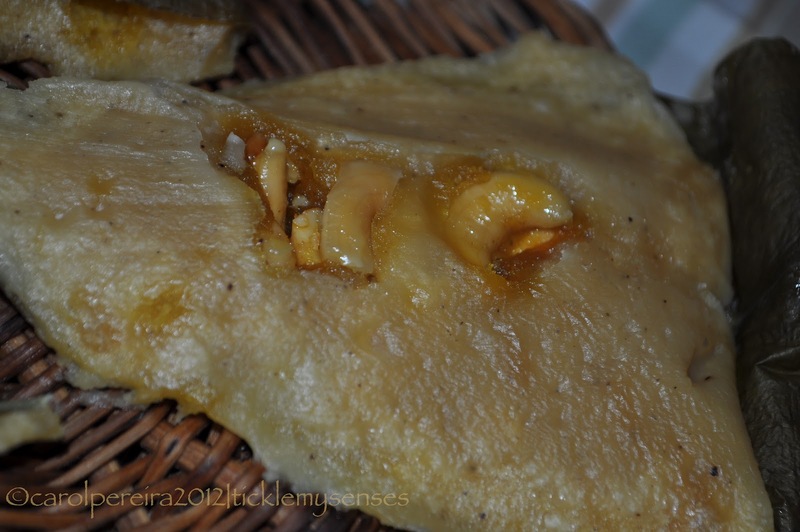 Since jackfruit is a rarity here, we have not been able to make it so far. 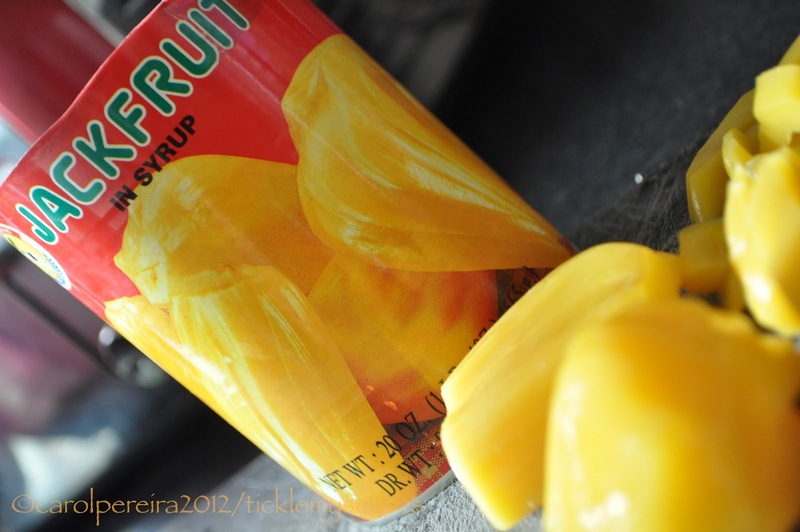 This week, lady luck was on his side, and he found a can of ripe jackfruit in the aisles of our local Asian store. Coincidentally our turmeric plant of 2 years had a few medium sized leaves ready for use, so we decided to make a few Ponsachey or Jackfriut patholis in these leaves. Today was a perfect day to make it, being a bank holiday Monday, weather being crappy and wet, Baby A on a mini snooze, we had the oppurtune time on our hands to conjure up these patholis. Believe you me, with this recipe they were ready to eat in record time, that is 35-40 mins from start to finish :))) don't believe me......read on. 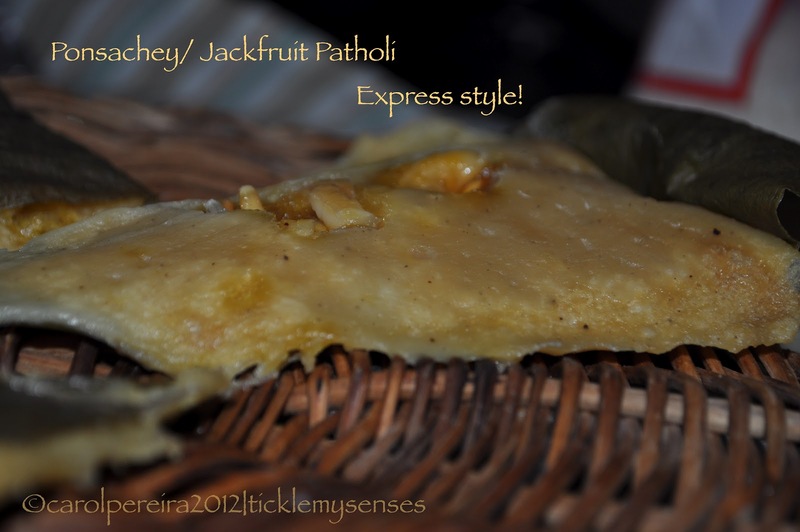 This is my cheat recipe for an amazingly quick and delicious Jackfruit/ Ponsachey patholi. It uses ground rice powder, canned ripe jackfruit, jaggery, grated or dessicated coconut and ready spices. For all Mangalorean food lovers living in areas where jackfruit is rarity (and can be found in cans....bonus as you don't have to spend hours doing the cleaning), turmeric, teak or banana leaves are hard to come by (use foil or baking paper), or if you like me just couldn't be bothered with the cumbersome soaking the rice for hours and grinding business, or the greasing of palms and cleaning jackfruit malarchy....this express recipe is MADE just for YOU!!!!! 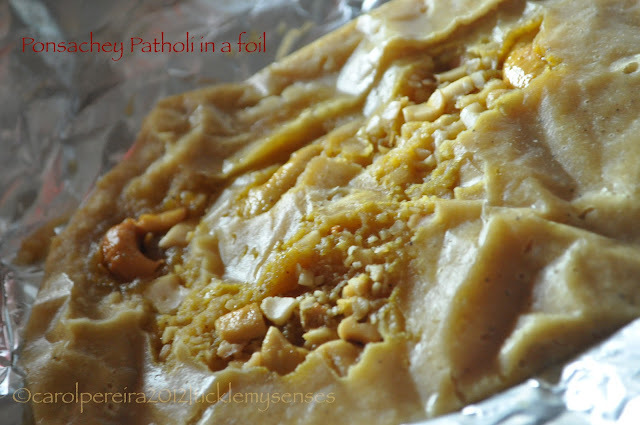 Ok I admit, patholis made traditionally from rice that is soaked and ground tastes better, for now I could care less, "Im sorry but 'Traditional' is temporarily on a break and 'Express' is here instead, Ive got 'little TROUBLE' brewing around the corner :)"
These patholis are wonderfully sweet, the jackfruit flavour shines through beautifully, with the hint of cardomom and pepper. 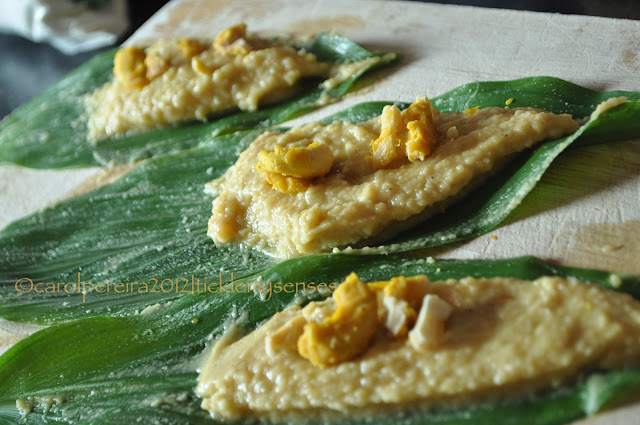 Its texture is slightly different owing to the ground rice flour. 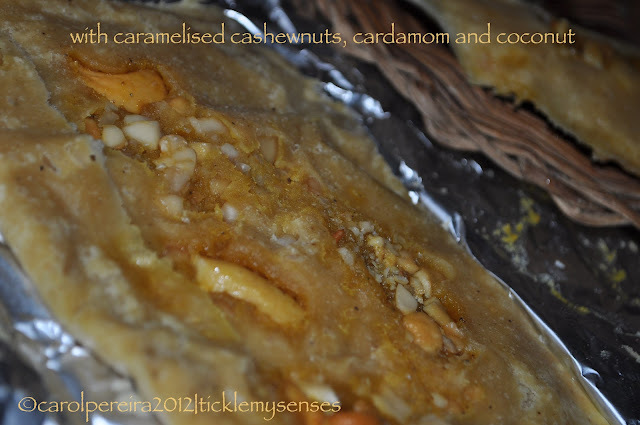 The caramelised cashewnuts adds that special touch which tempts you to dive in for another bite. The patholis steamed with turmeric leaves had an earthy distinct flavour that is very pleasing (29/08/2012: Updated: I spoke with mom today and she says jackfruit patholis are best made in teak leaves, or kitchen foil/ baking paper. 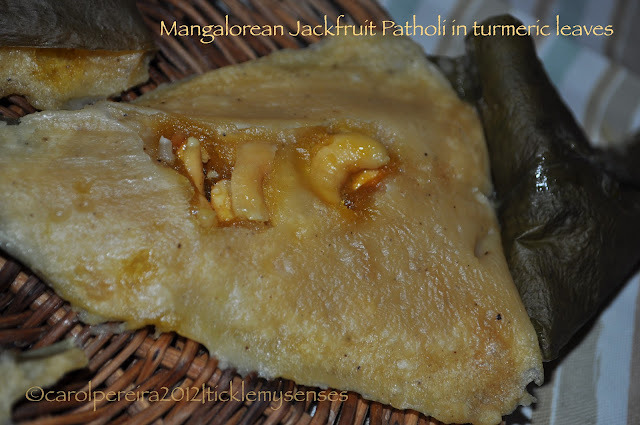 As Jackfruit has a wonderful fruity flavour on its own, the earthy flavour of turmeric might overpower it).The patholis made in foil were equally tasty. Definitely an enjoyable treat, thousands of miles away from home, for no effort at all. 1. 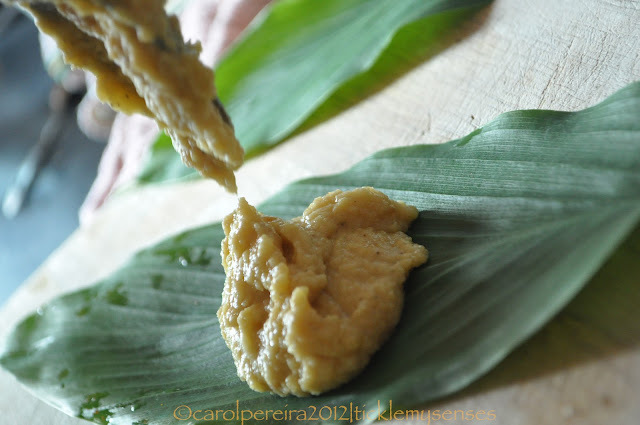 In a blender take the ground rice flour powder, add the chopped jackfruit pieces, jaggery powdered, salt, pepper, cardomom powder, 2-3 tbsp of liquer from jackfruit can and blend the mixture to a thick smooth paste. Taste a tiny bit of the batter for sweetness and flavouring and adjust accordingly. The consistency of the batter should be thick and should drop off the spoon. Adjust the consistency by adding more liquid if too thick. 3. Close the leaf and place on a perforated plate and cook in steamer for around 20 mins or till done. This quantity will make around 5-6 medium sized patholis. 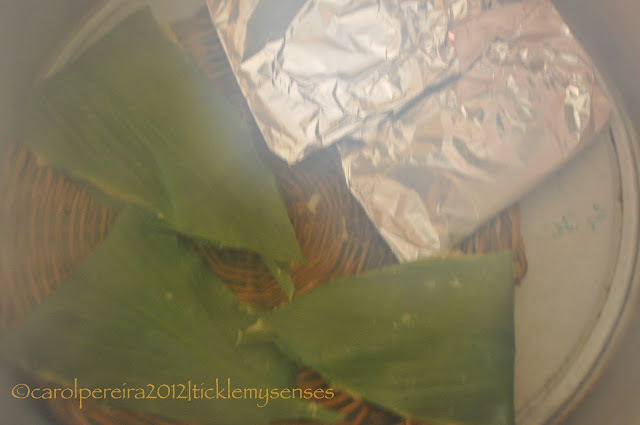 I made 3 patholis in leaves and remaining batter I steamed in foil. Enjoy on a rainy day with a cup of filtered coffee. I have been dying to make this. But in turmeric leaves. I love the flavour it imparts. You have given alternatives. I will try it on one of the coming festivals.